This allows you to select a template for creating a new 3D Impressions document. Let you browse to and select a 3D Impressions document previously saved to disk. Shows the most recently worked on documents. Click to open. Allows you to open a document from a screen saver file slot. Let you save the current document under a new file name. 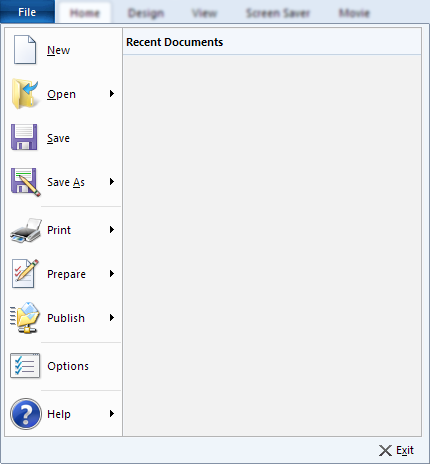 Allows you to save the current document to a screen saver file slot. These options allow you to preview and create and print-out of your document. Here you can change the documents embedded properties. These include: Title, Subject, Author, Comments and any Copyright Notices. Copies the current document to a screen saver slot. Packages the current document into a new file that embeds any referenced local pictures. This makes it easier to copy to another computer. Show Startup Tasks window on application start-up. When the Studio Editor is launched, this determines whether you are first presented with a list of 'Getting Started' tasks or whether just a blank document appears. Show Getting Started tasks after creating a new document. Sets whether the Getting Started task dialog box is shown after a new document is created using a template. Show Getting Started tasks after creating a new blank document. Sets whether the Getting Started task dialog box is shown after a blank new document is created. This shows you your current state of license and allows you to change them or view the End User License Agreement document. This allows you to change settings related to the 3D player and its use as a Windows screen saver. These include image quality, economy mode settings and selecting which screen saver slots are available for playback. Here you can choose which program functions are available on the Quick Access Toolbar shown in the application's title bar. Here you assign keyboard key-combinations to perform program tasks quickly. Gives you access to the product's online help or its About dialog box showing such information as product edition and its full version number.